Copyright © visitindia.org.in. All Rights Reserved. 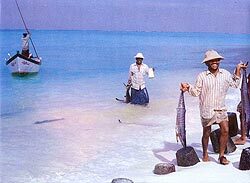 Lakshadweep is the smallest of the Union Territories of India. It is an archipelago of 27 islands spread in the Arabian sea, easily accessible from the coast of Kerala. It is ideal for water sports like Scuba diving, deep sea fishing, kayaking and also for para sailing. These are India's only coral islands. Only ten islands are inhabited and they are Andrott, Amini, Agatti, Bitra, Chetlat, Kadmath, Kalpeni, Kavaratti, Kiltan and Minicoy. Kavaratti is the capital of Lakshadweep and Bitra is the smallest. Only four islands (Kavaratti, Kalpeni, Minicoy and Kadmat) are open to Indian tourists and Bangaram, another island, is open to both domestic and foreign tourists. May to September is the ideal time to be on the islands if one desires to escape the rush of the tourists which is maximum in the months between November and March, and August. The coral islands of Lakshadweep a total of 36 of which 10 are inhabited in recent years has become a popular destination. One of the last places in the world where little has changed. Lakshadweep isles in the Indian ocean's Lakshadweep sea are sorrounded by lagoons and are known for their beauty. Monsoons last from May till September. The islands have a tropical climate and the temp never raises beyond 35°C. Bangaram is the only international resort in Lakshdweep and also an ideal location for a holiday like none else on the sub continent. Bangaram island is inhabited isolated amd unspoilt. Bangaram is sorrounded by one of the largest and safest lagoons with its calm, unimaginable blue - green waters, its beaches covered with white coral sands. For visit to Bangaram island tourists have to travel by flight from kochi to Agatti and are transferred from Agatti to Bangaram island beach resort by boat during the fair weather and by helicopter during the monsoon. Kavaratti is the capital and the most developed island. As the population of Lakshadweep is mostly Muslim there are 52 mosques in the island, the most remarkable of which is the Ujra mosque. Kalpeni has three uninhabited islands. Koomel is the bay where the tourist facilities are available. The water here is of even depth and the shoeline is long and perfect for swimming. Scuba diving is done here, with a basic course for newbies at the Kadmat Scuba Diving centre or Dolphin Drive centre in kavaratti od in Minicoy Dive centre which is run by the Lakshadweep administration. Shaped like a drop, this island is open to both domestic and international tourists and is a virtual haven for water sport lovers. By Air - Cochin International Airport links Lakshadweep with the mainland. Onward flights from Cochin are available to most of the airports in India and to selected foreign destinations. Agatti is the only airport in Lakshadweep. By Ship - Five passenger ships- MV Kavaratti,MV Tippu Sultan, MV Bharat Seema, MV Amindivi and MV Minicoy operate between Cochin and Lakshadweep. The passage takes between 14 to 20 hours. The Beginners course is a 8-10 day course conducted by trained instructors and dive masters and introduces you to the wonders of life under the sea, untouched and unspoilt. The average visibility is 150 ft. The minimum no. of dives is 15. All equipment is provided by Laccadives. Swimming skills are mandatory. The minimum age of diving is 14 years. A doctor's certificate declaring the canidate fit for diving is necessary. An 18ft 7 countrycanoe with outboard engine including crew is available on a rented basis here. Pablo boat with inboard diesel engine including crew and fuel can also be availed. Deep sea fishing can be done from Oct 1 to May 15th only. Glassbottom boat holding 4 passangers for 2 hours are available. Speedboats (8 pax) can be availed for excursions to the uninhabited islands. Snorkelling at ship wrecks can be done. Kayaks, catamarans and sail boats are also available here. To visit the Khadmat island foreigners have to avail the package tour ' Khadmat beach resorts and water sports institute organised by the SPORTS a wing of Lakshadweep administration.